Vespers completed, five monks gathered in the garden of a Canterbury Abbyin an apparent religious reverie. It was a pleasant, clear evening—June 18, 1178 by our reckoning, June 25 in the old Gregorian calendar. Contemplating a lovely crescent Moon they were shocked when something like a giant explosion wracked the heavenly body then watched in awe for some time as the Moon seemed to undergo fantastic changes. From the midpoint of the division a flaming torch sprang up, spewing out, over a considerable distance, fire, hot coals and sparks. Meanwhile the body of the Moon which was below writhed, as it were in anxiety, and to put it in the words of those who reported it to me and saw it with their own eyes, the Moon throbbed like a wounded snake. Afterwards it resumed its proper state. This phenomenon was repeated a dozen times or more, the flame assuming various twisting shapes at random and then returning to normal. Then, after these transformations, the Moon from horn to horn, that is along its whole length, took on a blackish appearance. Many scientists now believe that what those tonsured clerics observed was the effect of a collision of a small asteroid or comet fragment with the Moon which made a significant impact crater just over the observable horizon on what we call the dark side of the Moon. Cue Pink Floyd now. Those monks may be the only individuals ever recorded to have witnessed such a collision by the unaided eye. Giorano Bruno got roasted by the Roman Inquisition. For his pains, scientists much later named the hidden crater on the Moon for him. Specifically the impact may have created what we now call the Giorano Bruno Crater—after the Italian philosopher and Dominican Friar who was burned at the stake for expanding on Copernicus’s theories of a heliocentric universein which the Sun is just another star. He was a great martyr to science, but not born yet when those other Monks made their observation. The Inquisition made toast of Bruno in 1600. The crater is 22 kilometers in diameter and lies between the significant craters Harkhebi and Szilard. But evidence shows that Bruno is far younger, by probable millennia than its neighbors. Observed from space the rim is high and sharp, uneroded by eons of impacts from micro objects and space dust. It sits at the center of a symmetrical ray system of ejecta that has a higher almost white reflection than the surrounding surface. These radiate nearly 300 km from the center. All of this is evidence of, by the standards of the Moon, a veryrecent event. This NASA photo clearly shows the sharply defined Giodano Bruno crater between to much older neighbors. Soviet unmanned lunar probes first photographed the far side of the Moon beginning in 1959. Since then ever higher resolution pictures have been taken by Russian and American orbiters and NASA Astronauts viewed the hidden surface on Apollo missions. Based on analysis of those photographs, geologist Jack B. Hartung first tied the Monks’ long ago observation to the Crater Bruno. The explosion that they witnessed on the “upper horn” corresponded exactly with the location of the Crater just over the horizon. The observation also conformed to what many scientist expect would be the result of such a powerful impact—a plume of molten matter rising up from the surface consistent with the monks’ description. Much of the scientific community has agreed with the conclusion, but the theory also has its skeptics. Some complain that such a spectacular event should have been noted by others. But in England and most of Northern Europe it could have been seenby hundreds of thousands who were either illiterate and could not record the event or whose notations have simply not survived. 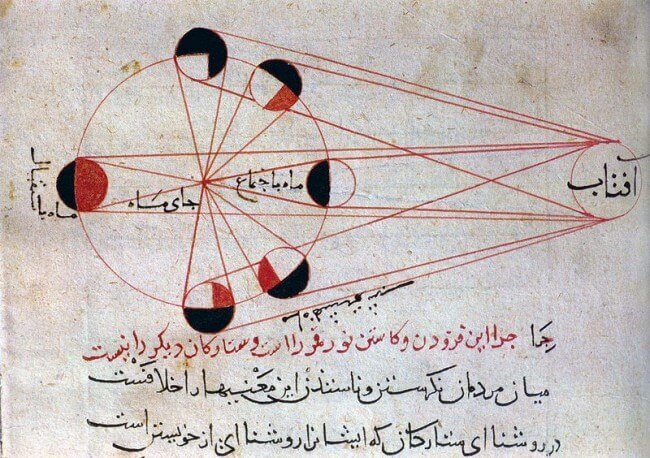 It was daylight in areas of other regular observers of the sky who did keep usually scrupulous notes—the Muslim scholars in Baghdad and elsewhere and the Chinese especially. Local weather conditions might not have been so clear. So that in itself is not telling. A more persuasive argument is that an impact of that magnitude should havesent tons of material out into space, most of which would eventually be captured by Earth’s gravity. It would have fueled a spectacular meteor shower that would have lasted more than a year. Yet no records of such an event can be found and falling stars were everywhere regarded as significant omens and clusters of them carefully recorded. Skeptics argue that debris from the Luna collition should have sent debris into space that would have eventually resulted in a spectacular and long lasting meteor shower, and event which was never recorded after the Monks’ observation. The same critics point out that a “recent” lunar event, even one which has been calculated to have occurred during the span of human history on earth can be very old in human terms—as likely to have been observed by Neanderthalsas by Medieval Monks. Despite the lack of meteor shower argument, other scientists have posed an explanation. If the impact was caused by a comet fragment, other large fragments passing close to the Moon, may have gathered the rising debrisfrom the surface in their own gravitational pull, dragging it behind them in a long orbit around the Sun. Skeptics still have to explain what the Monks actually saw or dismiss it as a fabrication or hallucination. The only explanation that they can come up will seems even more farfetched than the possibility of an accurate description of a collision. 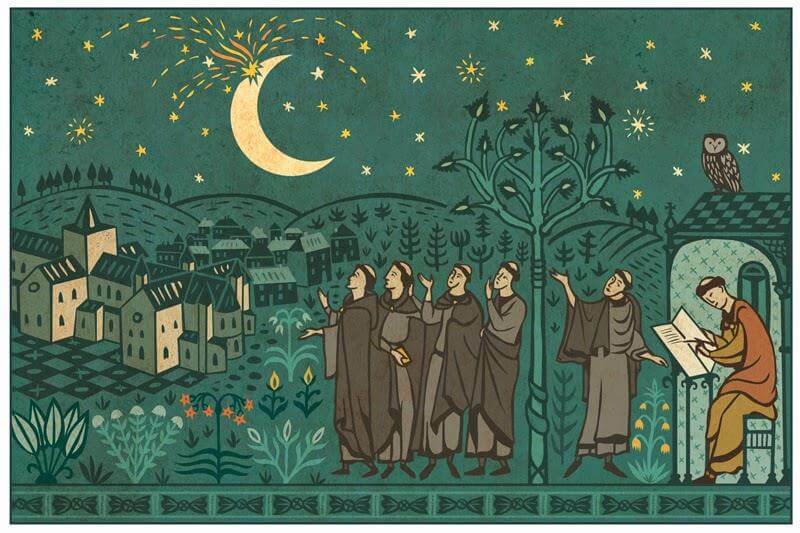 Their hypothosis holds that the Monks just happened to be in the right place at the right time to see an exploding meteor coming at them and aligned with the Moon. This would explain why the monks were the only people known to have witnessed the event because such an alignment would only be observable from a specific spot on the Earth’s surface.